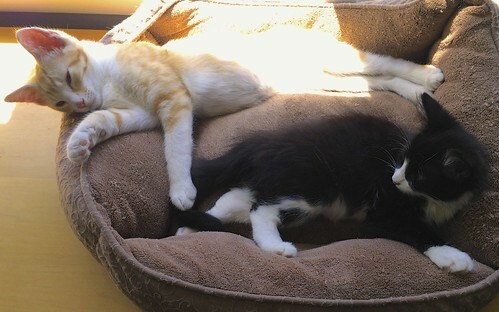 A month ago yesterday we picked up a couple of kittens from the local shelter. I've tweeted a few pictures but I thought it was time to introduce them here on the blog. I also pulled my DSLR memory card and got around to looking through the pictures I took the day they came home. It's so good to have cats around the house again! Edited to add 2014-09-05: Xcode 6 beta 7 emits a warning for assigning the NSCharacterSet to a NSMutableCharacterSet *. I've never received feedback from Apple on the matter but since it's caught now I marked the radar as resolved. Edited to add 2014-03-07: Filed a Radar for this bug. I can't link to that, but I also filed it on [Open Radar](https://openradar.appspot.com/radar?id=5874203416854528). Edited to add: Reading the code snippets in here is difficult. I can't find a quick & easy way to make them have horizontal scrollbars if I use a pre tag around it. Rather that have them be truncated I removed the pre tags for now so they word wrap. I'll bug Squarespace about it later. So far so good. I understand why I need mutableCopy, but at first I didn't understand why A ) fakeMutableSet wasn't mutable and B ) given that it wasn't mutable calling formUnionWithCharacterSet didn't cause an unrecognized selector assert. Seems like either it should be mutable or it shouldn't respond to the selector. I finally got around to writing some test code and I've found enough that I'm convinced there is a real bug here and it's not at all what I suspected at first. I'll write this up in a radar after I finish this post. I've placed the source on GitHub if you want to follow along. // *DOESN'T WORK* if the underlying data is not mutable. Admittedly, yes I have cast decimalSet so the compiler does not complain but I expected the runtime to skip the call because the instances shouldn't respond to the selector. Somewhere up inside formUnionWithCharacterSet there is code that says "if I'm not mutable just sort of fail silently." It would have saved me a ton of time if that had at least logged a line that says "this call didn't work". So yeah, if NSMutableCharacterSet objects were really a different class than NSCharacterSet objects I would have had a compiler error when I wrote the offending line without the mutableCopy. If NSCharacterSet objects didn't have methods to responds to selectors from NSMutableCharacterSet then I would have had a runtime assert. The NSCharacterSet and NSMutableCharacterSet API's sort of falsely represent what the data does. I don't see anyway to catch this happening from my code. So if you're using NSMutableCharacterSet be careful. Does this extend to other NSMutable* classes? I don't know. These are the only ones I use where there are a lot of "return a pre-populated instances" method so I'd have more trouble making a real world example using NSMutableArray or NSMutableDictionary. Much like the last stupid little helper category I plunked this in its own GitHub. Feel free to grab it if you need. You may notice that there are obvious other tests I could write it this category. I may in the future but for now, this is the only one I need. I'm not pretending to write some sort of comprehensive set of tests here, I'm just providing little snippets of code that I've found useful enough to isolate out and share in projects. I think (but can't confirm 100%) that what happened was in the early days of ARC that line invoked a copy operation and thus created a mutable set. But as time wore on somebody enhanced that and now it just references a prebuilt set. And the rest of the problem is just the way Objective-C works. I understand why it happens, but it wasn't something I expected, especially coming back into this code after doing C++ for a year. Anyway, sorry if this bit anybody on the rear end! OK, let's switch gears and not talk about cats for a while shall we? Although fair warning, this post will only be interesting to somebody who does iOS programming. Hey sometimes that happens. Last week I sold my car so California could get it dismantled. If you don't want programming articles ask me about that sometime, and maybe I'll write a post about that. And this is really the way I think of split views: there's a left controller and a right controller. I understand why that is represented as an array of UINavigationControllers but the whole point is that UISplitViewController should be an abstraction. When I think "OK, we need to notify the left ViewController that I just opened the map view so it can update the UI elements" I just want the left controller. I don't want to start thinking about stacks of controllers contained in an array and figure out the proper string of messages to get the left controller. And I do that all over the place. I kept copying that damn string of messages around and every time the "Keep it DRY" birdie would hoot shamefully in my ear. So I finally got fed up enough to make a category to make UISplitViewControlller do what I want. Of course, this wasn't that DRY because I had two projects and they each had these source files but it was better. Today I finally got around to sorting out how to put the category in GitHub as its own project, make a local repository, and then pull those files into both projects. This is actually the small code trial run for doing the same thing with some code that works around an iOS bug involving NSMutableCharacterSet. More on that later! Anyway, if this category sounds useful to you I cleaned up the source, figured a modern Creative Commons license for it and put it on GitHub. Enjoy and let me know if you have any issues!